My slight bit about Derrida is that his central contribution to the analysis of literature was creating a rhetorical means by which a generation of coming literary critics were relieved from having to discuss a book in a way that shows that they've actually read it. I've struggled with Derrida's work for several years, and have absorbed quite a bit of writing by him and about him and his ideas, and evasion of the book, the author's concerns, seems more the game rather than explication. Many times when one thinks they've come upon an oasis of actual discussion in this varicose discourse , both Derrida or an apostle one might be reading makes a hard turn, left or right, from whatever metaphorical road or river you might have been traversing; in any event, every side road, alley, tributary and inlet was wandered into and prated about until exhaustion drove the reader from the chair and desk they sat at, not convinced of Derrida's and deconstruction's vague premises, but rather resigned that this was a peculiar literary mafia who had no intention of treating literary work like it had an intrinsic worth. Derrida and his supporters argued otherwise, in their few moments of assertive writing, and maintained that the deconstructive process intends to reveal a multitude of interpretations by demonstrating what contradictory positions compose a nominally "authoritative" texts. It's a grand project on the face of it, an investigative premise intriguing enough to be worth a try, but the results of twenty plus years of post-structuralist theory applied to an arbitrarily termed "canon" produced not clarity, nor comprehension, but only more confusion. One understands why Harold Bloom, a former proponent of Derrida's method, tired of the nihilistic wallow of post-modernism and turned his attentions again to a more fruitful mission of literary criticism and the attending philosophical/religious digressions, how literature gives a reader and a culture an malleable interior superstructure one filters raw experience with. 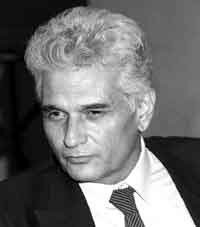 Derrida's accomplishment , I think, was to take assume an array of philosophical tropes available from credible philosophy survey course , add his own egregious seasoning to the unpalatable stew, and turn what used to the sort of infinite prattle of the cocktail party poser into book contracts, tenured positions, and all the other perks of being a celebrity intellectual. It's significant about Derrida's contribution to literary criticism that his name rarely, if ever, arises when useful quotes about authors and their books are the subject of a conversation. This is a twofold irony, the literary critic with nothing useful to say about what they've been reading, and an incredibly bad writer as well. That such an awful scribe makes such a dent in the upper reaches of the culture ought not surprise us, just as the success of Jackie Collins is a twofold irony, the literary critic with nothing useful to say about what they've been reading, and an incredibly bad writer as well. That such an awful scribe makes such a dent in the upper reaches of the culture ought not surprise us, just as the success of Jackie Collins no longer distresses mainstream book reviewers. Often times talent and ability have nothing to do with an author's good fortune. My principle misgiving with Derrida's ideas was his insistence that one cannot argue a point with certainty; there is a lot more to his arguments, subtle, abstruse, and obscured with every evasive trick of the tongue and pen he could muster, but this cluster of notions is at the heart of his life's work. I'm willing to grant that Derrida's intentions were all for the best--that he would expose how the production of meaning, and with it a hazy notion of "authority" comes from a socially constructed set of binary oppositions which, of course, entrenches in constrained ideas about reality-- but his failure to be clearer with his method and aim, and more useful in how readers and citizens can configure a discourse that might lead to ways of ridding the world of its internalized malfunctions has given us instead a sort of relativistic nihilism that advances the severest reactionary premises with what to do with the planet we live on. Baudrillard, certainly, has take the opening as a chance to advance his set of tightly quipped solipsisms that insist, at the heart of their gnomic devisings, that apathy is as effective and meaningful political gesture as any any collective might take on. Since no definitive or authorially fixed moral argument can be made against racism, genocide, homophobia, imperialism, colonialism , pollution, et al,so the thinking goes, one may as well go about their way in this existence unmindful of what constitutes ethics or responsibility, and fulfill such base desires and impulses that give that transitory definition to one's existence, a fleeting sensation of purpose to be replaced by another fleeting fleet sensation, and so on, until one drops, spent, exhausted, dead. This encourages apathy in the pursuit of truth, I think, and in fact reinforces such paranoid mind sets which needs to witlessly demonize whole sections of a society's citizenry as "other" and "evil". Racism and homophobia are allowed to thrive in the absence of the ability to make a principled statement, to have a debate, to reach a consensus about what constitutes an idea of right and wrong no longer distresses mainstream book reviewers. Often times talent and ability have nothing to do with an author's good fortune. My principle misgiving with the ideas was his insistence that one cannot argue a point with certainty; there is a lot more to his arguments, subtle, abstruse, and obscured with every evasive trick of the tongue and pen he could muster, but this cluster of notions is at the heart of his life's work. I'm willing to grant that Derrida's intentions were all for the best--that he would expose how the production of meaning, and with it a hazy notion of "authority" comes from a socially constructed set of binary oppositions which, of course, entrenches in constrained ideas about reality-- but his failure to clearly outline his method and aim, and more useful in how readers and citizens can configure a discourse that might lead to ways of ridding the world of its internalized malfunctions has given us instead a sort of relativistic nihilism that advances the severest reactionary premises with what to do with the planet we live on. Baudrillard, certainly, has take the opening as a chance to advance his set of tightly quipped solipsisms that insist, at the heart of their gnomic devisings, that apathy is as effective and meaningful political gesture as any any collective might take on. Since no definitive or author- fixed moral argument can be made against racism, genocide, homophobia, imperialism, colonialism , pollution, et also the thinking goes, one may as well go about their way in this existence unmindful of what constitutes ethics or responsibility, and fulfill such base desires and impulses that give that transitory definition to one's existence, a fleeting sensation of purpose to be replaced by another fleeting fleet sensation, and so on, until one drops, spent, exhausted, dead. An "it's" in the fourth paragraph should be "its." "And then the paragraphs comingle, propagating sameness and differance down the screen." I enjoyed reading this, as the man drives me crazy. All the same, I'm not quite ready to clean off my shelves. There's something powerful about the notion that contradictions can drive a story, and that meaning derives from oppositions that are always a bit off. As for ethics, I read a little differently. What I get out of it that I find useful is that ethics are embedded in language, and thus susceptible to whatever tricks language might play. Derrida's given me a better sense of some of those tricks. I agree the whole thing gets tiresome, but hey, it was the seventies. I have to admit that I can't dismiss Derrida in total, since what he's done is to require a new rigor to literary supposition. If nothing else, he's made us aware of many bad habits writers and critics fall into when limiting the scope of what texts can mean. All said, though, his habits got to be tiresome, as you say. I would have enjoyed him actually engaging a text in terms more personal; what can he connect the writing to. Too much of the time he demonstrated what the text isn't, and sadly a generation of critics danced around this misunderstanding of his project. Sounds like someone just bought a Large Woman's Machine. some kind of lemonade was served by rev.jackie mason at the ring taled goon tank at krike and squid avenues, new york city.